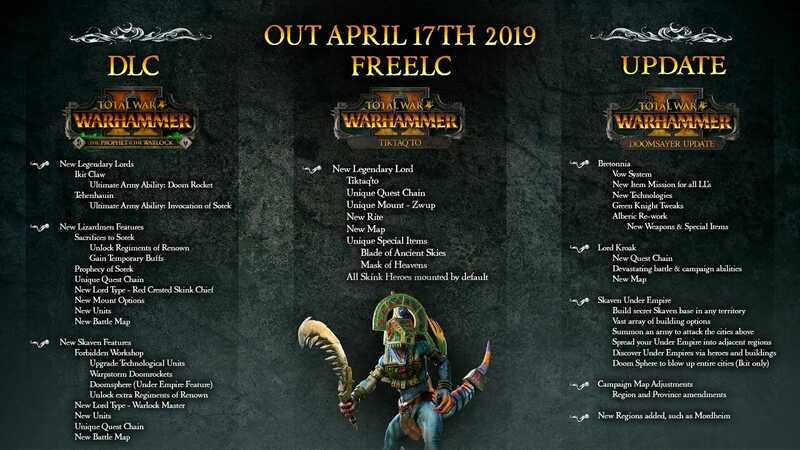 This automatic update arrives alongside The Prophet & The Warlock Lords pack, bringing a huge array of content additions, revisions, balances and improvements to the Eye of the Vortex and Mortal Empires campaigns. Ikit Claw and Tehenauin’s factions of Clan Skryre and the Cult of Sotek now appear in both campaigns under AI control, even if you do not own The Prophet & The Warlock. 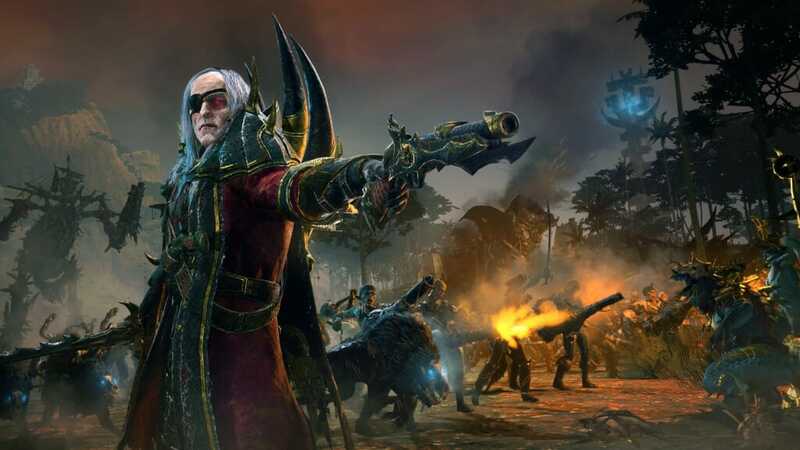 Given the influx of new lords and factions over the past year, the Doomsayer Update heralds a major overhaul to campaign balance and AI behaviour, in an effort to level the playing field. 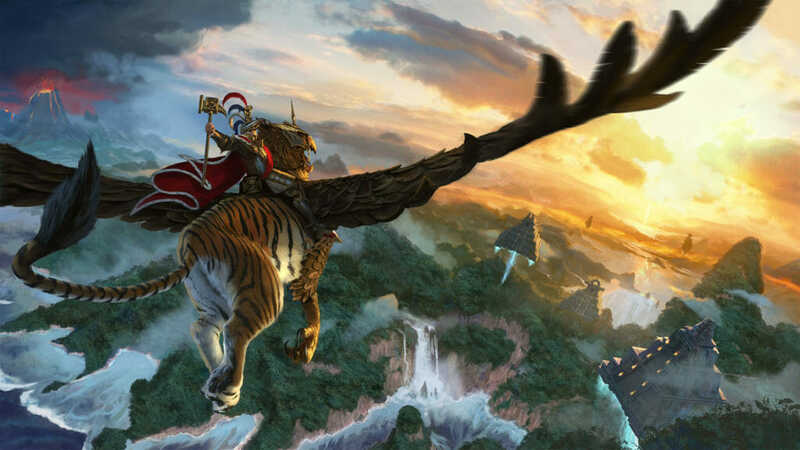 The update also adds multiple new territories to both the Eye of the Vortex and Mortal Empires campaign maps. These map revisions will be active in all new campaigns you begin after the update (they won’t appear in pre-update saves). The factions of Bretonnia also get a significant rework, addressing their buildings, techs, diplomacy, the Green Knight, and much more. And Alberic D’Bordelaux is now fully resplendent and armed with his mighty trident The Wrath of Manaan (plus a new animation-set to wield it with!). And a quick note on modding: when The Prophet & The Warlock launches, the Assembly Kit will not be able to process Startpos files. This is something that will be fixed with a small launcher update, which we are aiming to publish next week. BRETONNIA PLAYERS: Please note that your save games may leave you with income issues due to our new Bretonnia improvements. We suggest starting a new campaign or to finish off your current campaigns using the public beta instructions above. You can find the The Prophet & The Warlock FAQ here, and you can find the master feedback thread here. When conquering an enemy settlement, Skaven armies now have a new post-battle option. Alongside Loot & Occupy, Sack, and Raze, the army may now choose to Expand Under Empire. This leaves the settlement intact but establishes a new Skaven undercity beneath it. With four building slots, an undercity is a powerful addition to your infrastructure, but the more it is developed, the greater the risk that it will be discovered. If discovered, it will be demolished. Blessed Spawnings: when you begin a new Lizardmen campaign after the Doomsayer update, There are now 4 different mission types for Blessed Spawning missions: Battle captives, Kill Entities, Raze/Sack, and Defeat X Armies. Each of these mission types has a common and a rare variant. Variants have the same conditions for completion but the common variant rewards common units and the rare unlocks uncommon/rare units. These missions should not be active at the same time. Furthermore each mission type has 3 campaign stage variants, for early, mid and late game. All these do is change the mission requirements to complete them: e.g. kill 500 in the early-game, kill 1500 in the late-game, etc. This makes for a total of 24 potential missions for Blessed Spawnings. Reduced the penalty of Lizardmen vs Lizardmen aversion for AIs that are internally hostile from -30 to -15. Khainite Assassin: added Vanguard deployment, +2 run speed. Projectile now applies poison contact effect. Loremaster of Hoeth: -5 charge bonus, -150 cost. Alith Anar: increased projectile accuracy, +25 ap projectile damage, +7 base projectile damage. Frostheart Phoenix: -2 charge bonus, +1 melee attack, +30 ap melee damage, +10 base melee damage. Helblaster Volley Gun: increased accuracy. Witch Hunters: Accusation is now a hex. No longer deals direct damage. Instead reduces armour by 30, melee defence by 26 and missile resistance by 22 for 35 seconds. Steam Tank: +2 melee attack. Fixed animation issue that was increasing Wyvern flying melee attack interval by seconds. Doom Divers: +115 ap projectile damage, -105 projectile damage. Thorgrim Grudgebearer: +2 melee attack, +400 health, +5 ap melee damage, +45 melee damage, +5 armour. Ungrim: +400 health, +4 melee defence. Count Noctilus – foot: -10 armour, -500 health. Zombie Gunnery Mob (Handcannons): -1 ap projectile damage, +1 base projectile damage. Varghulf: +20 ap melee damage, +10 base melee damage. Casket of Souls: +4 explosion damage, +8 ap explosion damage. Bone Giant: +20 ap projectile damage, +13 base projectile damage. Treekin: -2 charge bonus, +5 melee attack, -3 melee defence. Glade Riders (Hagbane Tips): +3 ap projectile damage, -3 base projectile damage, deals magical damage. Glade Guard (Hagbane Tips): +3 ap projectile damage, -3 base projectile damage, deals magical damage. Waywatchers: +1 base reload time. Primal Instincts: Activation threshold reduced to 20% health left. Now also buffs charge bonus by +16% and melee attack by +8. Kroq-gar – foot: +136 health, added charge defense vs large, +8 bonus vs large. Kroq-gar – Cold/Horned One: +8 bonus vs large. Skink Chief on Terradon: now has a stronger drop rocks projectile. Increased mass for Terradon. Skink Priest on Terradon: now has a stronger drop rocks projectile. Increased mass for Terradon. Men-at-arms (Polearms): -25 mp cost, +1 bonus vs large. Skaven Assassin: added Vanguard Deployment. Now uses Assassin’s Trophy instead of Queek’s unique Trophy Heads ability. -50 cost. Summoned Plague Monks: corrected entity health to match Plague Monks. Gaze of Mork: -95 explosion damage, +25 ap explosion damage, -15 ap projectile damage, 30 base missile damage, -22 bonus vs large per projectile. Beloved Son of Bretonnia: Removed requirement for targeted units to be above 50% morale. Fixed several instances where braziers would appear sunken into the ground on battle maps. Fixed an instance where diplomacy and advisor voice over could trigger at the same time. Pirate coves are no longer visible by the other player in multiplayer head to head campaigns. Intervention cost text no longer overlaps panel in 4k. Ungrim Ironfist now has a victory condition to defeat Chaos. Demolishing the Royal Menagerie will now correctly remove the building rather than lower the level. Durthu’s “Eldest of Ancients” lord trait now applies to Forest Dragons and Branchwraiths. 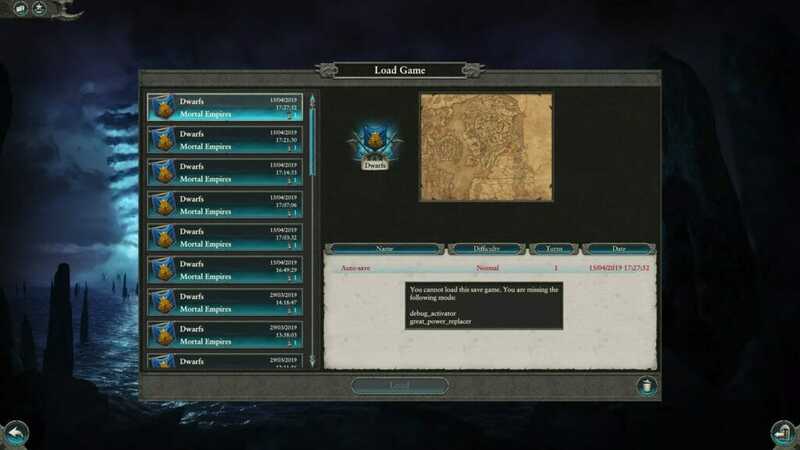 For those who have different mod lists across different campaign saves, or struggle to remember which mods were used for which save, we’ve added a feature that warns you when you attempt to load a game without activating mods it may require. We hope this will avoid unnecessary technical issues and crashes when you attempt to load a save that requires a specific mod. The Load button will be deactivated when a save is missing required mods. However, if you wish to override the warning like the crazy chaos worshipper you are, you can double click the save you wish to load. When the DLC launches, the Assembly Kit will not be able to process Startpos files. However, this is something that will be fixed with a small launcher update that we are aiming to publish next week. The DLC team have added a few new Lua commands for modding scripters on request. We will post more documentation on the DLC and accompanying patch for modding on our forums and on the CnC modding Discord.